Is Your Mouse Double Clicking? Introduction: This is not actually a review of the Cougar 700M gaming mouse, but rather an investigation into the issue of mouse buttons "double-clicking" when only a single click is made. Below are my observations and my investigation into why my 5 week old Cougar 700M gaming mouse started going crazy this winter. A substantial part of the article is based on my review of the mouse posted at Amazon, where I purchased the 700M. The Cougar 700M has some good features, but I am writing this review because of the problems that I encountered with the first mouse product that I have purchased from this company. I am not a big fan of the "Transformer' appearance of the mouse, and that is not why I bought it in the first place. I wanted a mouse with high precision that had good placement on the buttons. In general I like the button layout on the 770M, and the feel of the mouse in your hand is good. I don't like the deep grooved surfaces on the left and right sides, they do not need to be that textured, and they tend to pick up dust and other debris over time. They are also hard to clean because the grooves are relatively deep and very narrow. The braided cord also tends to pick up dust and lint over time. The software is good, and gives you lots of control over the mouse setup. You get 4 settings for different dpi/sensitivities. Now for the problems. After about 5 weeks of normal use (no dropping or other issues that might have affected reliability) the left mouse button started performing "double clicks" when only a single click had been made. At first I did not pay too much attention, but it began to happen more frequently, often while working on a spreadsheet or when selecting files from a folder. So rather than selecting a file or folder, the file or folder would open. I would go to select a cell in the spreadsheet, and instead it would go into text editing mode while I was trying to do a "Ctrl-C" to copy the contents of the cell. As this happened more and more, the mouse became less and less usable, and very frustrating. As Amazon is not one of our authorized resellers, please process returns with Amazon. "When purchasing on Amazon, if that particular ad for the item states " Sold by MALABS, fulfilled by Amazon" then warranty service can be processed by HEC as MALABS is one of our authorized reseller. Unfortunately, that is how the rules work as there are many individuals and small stores out there that sell through Amazon, and we cannot authenticate the nature of the products unless they are our registered resellers. The mouse was sold from and fulfilled by Amazon. I found it extremely strange that a small outfit like MALABS was considered to be an authorized reseller, but that Amazon was not. Nonetheless, I contacted Amazon and explained the situation to them, and despite the fact that they did not have an obligation to fulfill Cougar's warranty, they immediately cross-shipped a replacement and sent me a return label to return the defective mouse. I have the new mouse installed, and so far no double click problems. We will see what happens over the next few weeks and months. If I have any problems I will update this review. I received a new 700M and at first all was well. However, within 2 days the new 700M mouse began to show the double click problem much worse than the first one. Sometimes almost every click was a double click (folder or file would open rather than just get selected). So I began to think that it must be some other problem with my computer (Intel i7 3.3GHz, 12GB RAM, Windows 7 Ultimate). I went into full diagnostics mode. 1) I first moved the USB plug for the mouse from a USB 3.0 socket to a USB 2.0 socket. Same problem. 2) I put an older (~ 1 year old G400s) Logitech mouse on the original USB 3.0 socket. No problem with double clicks at all using the Logitech mouse. 3) I disabled the Cougar mouse control software (UIX) at Windows startup. Same double click problem. 4) I adjusted the double-click speed in the Windows 7 mouse control panel. No luck. 5) Plugged the 700M into a different Windows 7 computer (I noticed a very long driver install time) and guess what? The first click opened a folder rather than selecting it! The problem was just as bad on a different computer, without the Cougar mouse control software having ever been installed. 6) Just for the heck of it, I plugged the 700M into a 14 year old Windows XP computer that was still functioning well. The first click on a folder opened it! The bottom line was that there appeared to be something very wrong with some Cougar 700M mice. Maybe a bad batch of switches, maybe a design flaw in how the switches are mounted in the aluminum frame. Who knows? I have had many mouse buttons fail to work, but I have never experienced this accidental double-click problem with mice in the past, and I have owned many different mice from different manufacturers. Right now the Logitech G400s is working perfectly. It is not as nice as the 700M, but it doesn't make accidental double-clicks. I have uninstalled the UIX software, am returning the mouse for a refund, and I won't be buying mice from Cougar until the problems are corrected. Cougar mice are made by a Chinese company known as the HEC Group who specializes in aluminum, pharmaceuticals and resorts. Clearly, they are not focusing on their computer hardware quality. *Second update: After looking into the issue more I see that Logitech mice have gotten many complaints about this issue (although I have not seen this particular problem with any Logitech mice I have owned, which number in the dozens). However, one person on the Logitech forum mentioned that in low humidity environments an electrostatic charge can build up on the plastic, and cause the microswitch to misread the clicks. We just had a polar vortex come through with temps around 0, and the humidity in the house is down to around 38%. Using your breath to humidify the switches supposedly fixes the problem. I have the 700M boxed up and ready to ship back, so I did not test this to see if it worked. Either way, it is a design problem that could be easily fixed with metal switch covers that are grounded. I am tempted to take it out of the box to test it. If I do, I will update. *Final update -SOLVED; I couldn't resist. I had to test out the low humidity hypothesis. I took the 700M out of the box again, and plugged it in. The problem was severe. I breathed some humidity onto the mouse, and immediately the problem was lessened, but not gone. I slipped a small piece of aluminum foil under the left switch and touched it to a metal object. I removed the aluminum foil and breathed on the mouse again. Problem gone. Unfortunately, we are having a very cold period now and our whole-house humidifier struggles to keep the house at 38 to 40% relative humidity. So until this mouse is redesigned with grounded metal switch covers, or with special non-static plastic switch covers, I just don't want to keep breathing on my mouse to prevent the double click problem. There is no way to be sure without more testing, but my guess is that the 700M suffers from its overall design. 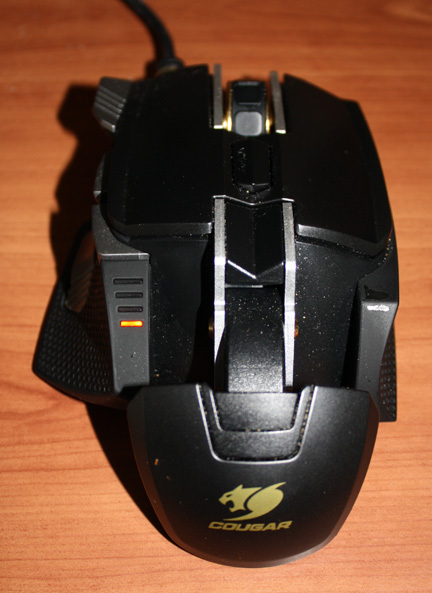 The aluminum frame is one of the best features of the 700M, making it feel better than a plastic mouse body. But the plastic switch covers apparently build up static charge under use and low humidity conditions, and this can discharge to the aluminum body in a way that registers more than one click. Conclusions: Based on what I was reading at the Logitech Forums, this is a problem that affects many different mice, most often in the winter time when indoor humidity is very low, and static buildup is high. So I can't fault The HEC Group and Cougar beyond the facts that they were not good about warranty replacement, and they designed the mouse so that it has a serious electrostatic buildup problem under low humidity conditions. RATINGS: I really liked the 700M, but I can't be bothered with breathing on my mouse in the winter to prevent it from double clicking. They need to change the design to prevent electrostatic buildup that interferes with the microswitch operation in low humidity conditions.